The imprint contains information about the purpose of a website and its owner. We are required by regulations in our country to provide this info. 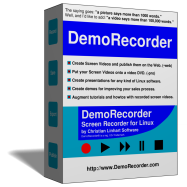 Information about our product DemoRecorder and our services around DemoRecorder. Selling of DemoRecorder licenses, maintenance, custom development, and other services around DemoRecorder. Contact by phone: +43 660 7304840. Only use the phone for things that cannot be done by email. Before calling, please schedule an appointment by email. We do not provide phone support! Please use email for support inquiries. Unscheduled phone calls are usually not answered directly, so please send an email or leave a voice message indicating your agenda.